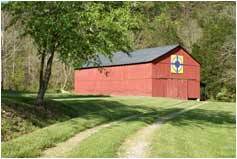 Many of the quilt patterns, the barns, and the buildings that are a part of Kentucky's Quilt Trails have fascinating stories behind them, and many of these stories have been documented by Community Scholars. Community Scholars are graduates of a six-week training program sponsored by the Kentucky Arts Council at different locations around the state. Participants learn to use the tools of the folklorist to identify and document traditions in their own communities through oral history interviews and documentary photography. Here are two examples of quilt trail stories by Community Scholars. Kentucky Route 32 winds through creek bottoms, past steep pasture land and through a hardwood forest. Redbuds, dogwoods, service berry and native wildflowers welcome you in spring and beckon you in the fall to experience Mother Nature's wondrous wardrobe. This scenic road takes you to Martha, Kentucky. In the early 1800s, Emmett Barkers great-grandparents left Pound Gap, Virginia, and settled on a farm in Martha. Along with them, G.W. and Elizabeth Branham brought a wooden trunk stuffed with family treasures. Recently, Emmett and his wife Carol searched through that trunk. They found a quilt square that had traveled in the trunk from Virginia. We loved the quilt square idea from the start and talking Mom and my cousin, Deanna, into working on the square was easy. Mom really took the time to pick a different square along with one being a part of our family history. The barn at her family farm was a great selection due to so many of her brothers serving in World War II and the Korean War along with other family members who have been in the military,” said Emmett and Carol’s daughter, Johnda Barker. 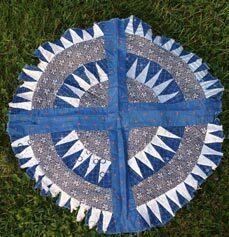 I dont know what the pattern is, but it was the one we chose because it had to be Emmetts grandmother who pieced the square, Carol said. The shadow doesnt fall upon the quilt square, instead the light and dark of evening shadows highlight the path that leads to the quilt square posed in a spotlight created by natures sun beams. Inside the small house, each antique bed is covered with a handmade quilt. I make quilts and so did everyone else in my family. My mom made everything from curtains to bedspreads,” said Carol as she talked about the house that was built prior to the Civil War. You know where to find me for the rest of our lives....at Johnny and Martha Barkers farm in Martha, Kentucky! There is still no place like Papaw and Mamaw's even at my age! Its my little wide spot in the road, Johnda added. "Crown of Thorns," photograph by Gwenda Lynn Huff, Lawrence County Quilt Trail. Family quilt square that had traveled in the trunk from Virginia, photograph by Gwenda Lynn Huff. 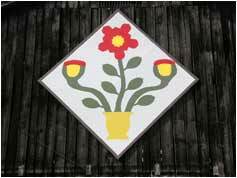 Jennifer and Alfredo can see the Rose of Sharon quilt block on the big, black barn before they turn in the drive. Deann is waiting for them at a garden table outside. She takes Jennifer into the house while James shows Alfredo the barn. Inside, Deann unpacks a bag of heirlooms from James' family, including a collection of family letters dating back into the 1800s and an old quilt with the Rose of Sharon pattern, fragile after years of use but no less amazing in its precise stitching. JENNIFER: So who is the maker of this beautiful old quilt? (looks through papers and old letters) six generations back. James' sister Carolyn, who is the one that restored this, has provided us with the patterns so that when (our daughter) Mary Jewel gets a little older, she can recreate it. JENNIFER: What made you decide to do a quilt piece on your barn? DEANN: Hope Smith and Debbie Hacker (from work) were talking about it and I thought it was a neat project. My grandmother was a quilter; James' mother was a quilter, so its just a piece of heritage. Weve got a group of students working on about 10 patterns to put in and around the city. The city bought the materials. Were trying to get the kids involved in picking out patterns that were their parents, or a pattern that had meaning. JENNIFER: So what do your kids think of it? DEANN: They like it. Their friends drove by and helped paint; our neighbors helped paint; one of the art teachers came over and helped us mix paints and get the colors. Carolyn had done all these to-scale pieces so we just adjusted to make it fit the board. We rotated this one to the side cause when you look at this quilt it really is a diamond. JENNIFER: What made you choose this quilt to make the block from? DEANN: This is the oldest quilt that we have in James' family, and in honor of his sister because she was diagnosed with cancer right about the time we got started on this project. JENNIFER: What kind of hardware did it take to put the quilt block up on the barn? JAMES: I put 90-degree metal angles at each corner, just to hold the frame together. Then we got a bucket truck from the electric company  volunteer  to come out and put it in with 3/8-inch light bolts. ALFREDO: The frame is treated lumber? JAMES: Heavily painted with exterior acrylic latex  to my knowledge acrylic latex is about as durable as anything you can get, and you can get the colors you want. ALFREDO: How long has it been up? DEANN: It has weathered well. Everyone walks out to the barn again. A few more photos are taken and James convinces Jennifer to ring the big dinner bell at the end of the driveway before saying goodbye. The rearview mirror reflects a quilt pattern that has held meaning for generations brightening the top of a barn on a farm with a long and meaningful history.